The Chemistry Handbook begins with a clear, concise introduction to the fundamental concepts of chemistry, including the atomic structure of matter. It goes on to discuss and explain the periodic table and the significance of the information in a periodic table, chemical bonding, the laws of chemistry and chemical equations. The handbook also includes information on the chemical interactions involved with corrosion processes, water chemistry control, including the principles of water treatment, the hazards of chemicals and gases and basic gaseous diffusion processes. This information will provide YOU with a foundation for understanding the chemical properties of materials and the way these properties can impose limitations or potentially cause disasters in planned experiments and serious projects. The information in the handbook is presented to provide a foundation for applying engineering concepts, including hydrogen energy applications. The Chemistry Handbook presents more than enough information to provide the reader with a fundamental knowledge level needed to understand more advanced theoretical concepts presented in many other scientific areas of study. This great book on Lead-Acid battery theory and use is now provided FREE with purchase of the Department of Energy Chemistry Handbook. The Classical Physics handbook explains crucial concepts of energy, work and power, and how to convert, measure and calculate the energy involved in various applications and experiments. It also includes other incredibly important information on the units used to measure physical properties. For example, the handbook includes how vectors are used to show the net effect of various forces; it also covers Newton's Laws of motion, and how these laws affect motion and static and dynamic forces. This information will provide YOU with a foundation for applying engineering concepts. The Classical Physics handbook presents enough information to provide YOU with a fundamental knowledge level sufficient to understand the advanced theoretical concepts presented in other subject areas and to better understand basic system and equipment operations. The Mechanical Science handbook includes detailed explanations of operational terminology, as well as information on diesel engines, heat exchangers, pumps and valves. This book will provide YOU with a technical foundation essential for understanding the construction and operation of mechanical components such as Flywheels, Camshafts and Fuel Systems. The Mechanical Science handbook contains the information that YOU need about basic systems and equipment operations which are associated with various Hydrogen Science applications and experiments. 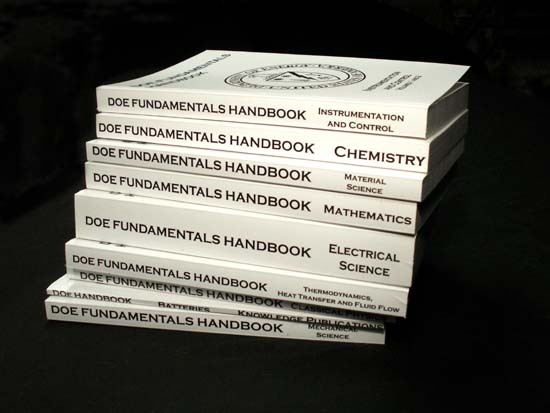 The DOE Fundamentals Handbook - Mechanical Science consists of five modules that are contained in two volumes. The Mechanical Science handbook includes detailed explanations of Operational Terminology, as well as, information on diesel engines, heat exchangers, pumps and valves. This Book will provide YOU with a technical foundation essential for understanding the construction and operation of mechanical components such as Flywheels, Camshafts and Fuel Systems. The Mechanical Science handbook contains the information that YOU need about basic systems and equipment operations which are associated with various Hydrogen Science applications and experiments. The Mathematics handbook includes a review of introductory mathematics (i.e. addition, subtraction, multiplication and division involving whole numbers, decimals, fractions, exponents and radicals) and the concepts and functional use of algebra, geometry, trigonometry and calculus. Word problems, equations, calculations and practical exercises that require the use of each of the mathematical concepts are also presented. This book will provide YOU with a foundation for performing basic mathematical calculations and understanding the significance of things like quadratic equations, the Pythagorean Theorem, logarithms and trigonometric functions of sine, cosine, tangent, cotangent, secant and cosecant. The Mathematics handbook presents more than enough information to provide the reader with a fundamental knowledge level sufficient to understand advanced theoretical concepts presented in many other subject areas, including all of the sciences, statistical use of data and all those other realms of life that our parents and teachers told us way back when that we would need math for some day… This book is a Godsend for undergraduate students preparing for the GRE’s who are in desperate need of a wonderfully clear, concise and FUNDAMENTAL breakdown of mathematics. It is also particularly useful for anyone in any field that finds their math skills woefully inadequate or even just rusty to the point of irritation. The Electrical Science Handbook begins with a clear, concise introduction to important terminology and basic electrical concepts including Direct Current (DC) electrical circuits and more. Subsequent sections go on to introduce rules associated with the reactive components of inductance and capacitance, batteries, circuit arrangements, voltage production of various generators, voltage regulators electrical motor characteristics, transformer theory and electrical distribution systems. The information in the handbook is presented to provide a foundation for applying engineering concepts. At 450 pages, this handbook is of one of the finest books on electricity and electrical science that you’ll find. There is NO better book out there anywhere to keep on-hand as your personal reference book for detailed explanations of A/C-D/C, ohm, volts, ampere, power, watts, wire, math and just about anything else you might need to know about the electrical field. Understand Electricity!!! The Electrical Science handbook presents more than enough information to provide YOU with the fundamental knowledge needed to understand the advanced theoretical concepts that drive forward frontiers of energy sciences. The Instrumentation and Control Fundamentals Handbook discusses information on temperature, pressure, flow and level detection systems, position indication systems, process control systems and radiation detection principles. The information in the handbook is presented to provide a foundation for applying engineering concepts. It presents more than enough information to provide YOU with a fundamental knowledge level sufficient to understand the construction, operation and failure modes of various types of instrumentation and control systems, as well as the principles and theoretical concepts behind them. The Thermodynamics, Heat Transfer, and Fluid Flowhandbook explains all you need to know about Thermodynamics and the three modes of heat transfer: conduction, convection and radiation. If you plan to do any solar heating experiments, or just want to understand and improve your home’s heating systems, this book will prove INVALUABLE. The handbook also describes the properties of fluids, the relationship between the different types of energy in a fluid stream through the use of Bernoulli's equation and discusses the causes of head loss in fluid systems and the factors that affect head loss. This book will provide you with the basic understanding of Thermodynamics, Heat Transfer and Fluid Flow needed to be part of the hydrogen revolution. The Nuclear Physics and Reactor Theory Fundamentals Handbook contains elaborate discussions on Atomic and Nuclear Physics, Neutron Characteristics, Reactor Theory and Nuclear Parameters and the Theory of Reactor Operation. The information in the handbook is presented to provide a foundation for applying engineering concepts. It presents more than enough information to provide YOU with a fundamental knowledge level sufficient to really understand basic concepts of atomic physics, including the atomic nature of matter, Radioactive Decay, fission, the Neutron Life Cycle, Reactor Kinetics, as well as the interaction of radiation with matter and much, much more. In this great package deal you get all DOE Fundamentals Handbooks for $133.95 - save over 50 Dollars!